Enter the Ellen’s 12 Days of Giveaway 2016 and you could win the coveted 12 Days of Prizes as seen on the show! 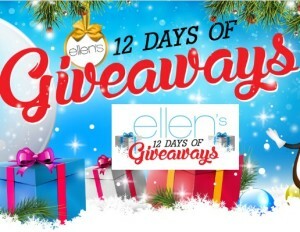 This year Ellen’s giving you 12 different ways to win each day’s prizes during the 12 Days of Giveaways! One of Ellen’s viewers will win every single giveaway from 12 Days, just for watching the show! Other ways to enter ad win include: ellentube.com Ellen’s emoji exploji app, Facebook, Twitter and more. Starting Monday, November 21st, 2016, and through and until December 8th, 2016. The contestant must select the correct Holiday Emoji seen on that day’s Show. You must also submit written statement of no more than approximately fifteen hundred (1500) characters describing why Contestant deserves to win and a photograph of Contestant. One lucky winner will get one prize pack containing gifts given to “The Ellen DeGeneres Show’s” live studio audience during the “12 Days of Christmas”. The ARV is between $30,000-$36,000. Daily entries will boost your chances of winning. So do not miss out! 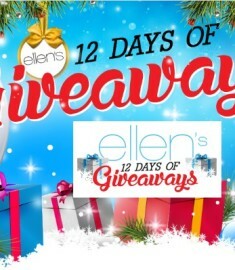 The Ellen 12 Days of Christmas Giveaway is popular every year and who can blame us for getting a little excited!